Every second counts for all the working moms out there. Our lives are specifically planned by the minute. From the moment we wake up to the time that we put the kids to bed, every minute is valuable. What composed a busy day to the others seems a little understatement for us. On the contrary to what most people think, our day is just starting after we complete an exhausting 9-5 shift at the office. We change from our office gear to our aprons and start another 6 or 8 hour shift with our much more demanding bosses – the kids. There are days that we are so tired and crunched for time that instead of preparing a home cooked meal for the family, we just grab our phones and order from a nearby restaurant. 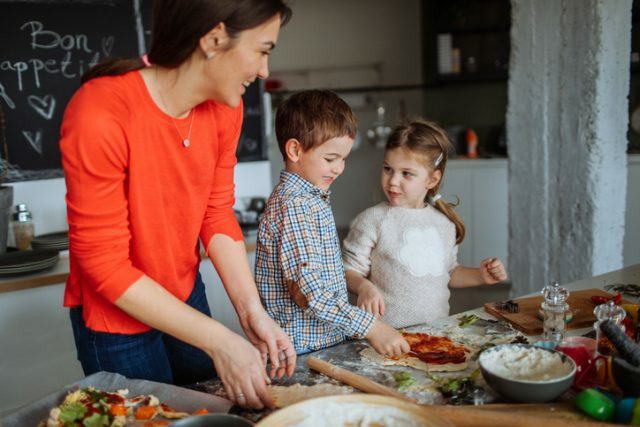 To help us beat the clock, here are some fast, easy and delectable weeknight dinner solutions that working moms can make in 30 minutes, tops. Packed with veggies and protein, this healthy and kid friendly dinner is a topnotch. Season the chicken fillet with salt and pepper. Dip each fillet in beaten egg and cover with flour. Fry each side for five minutes. Get the lettuce, tomatoes and corn kernels ready. Spread some ranch dressing on a preheated wrap. Stack the lettuce, diced tomatoes, chicken fillet and corn kernels neatly on top of the dressing. Add in grated cheese and carefully close and roll the wrap. Slice each wrap into two or three and serve. Who would say no to shrimps. This tasty recipe is perfect to cap your day. Mince the garlic and chop two salted eggs into small pieces. Heat the pan and saute the minced garlic in vegetable oil. Add in 10-15 shrimps and two to three tablespoons of butter. Continue cooking until the shrimps turn pink. Add in the salted eggs, a tablespoon of milk and some salt and pepper to taste. Cook for another minute or two. Serve while hot. Deliciously served over pasta or rice, this classic adobo is perfect for your Asian themed night. Start with sauteing the minced garlic in a heated vegetable or canola oil. Add in four slices of chicken breast or thigh. Pour in a cup of vinegar, a cup of soy sauce and ½ cup of water. Let it simmer for 15 to 20 minutes. Mix in a teaspoon of oyster sauce and ½ teaspoon of brown sugar. Gently add in a cup of pineapple tidbits. Stir the dish and let it sit for a minute or two over low fire. Serve while hot. An all-time favorite at our home, the homemade meatballs in tomato sauce is so easy to make. To prepare the meatballs, mix in 500 grams of extra lean ground beef, grated cheddar cheese, grated carrots and grated onions. Add some salt and pepper to the mix. Wash your hands and start shaping the mixture into golf-ball size meatballs. Deep fry the meatballs and set aside. As for the tomato sauce, saute minced garlic and chopped onions in a heated oil. Add in two cups of tomato puree. Wait for the mixture to boil and lower the heat to medium setting. Add in the fried meatballs and mix. Let the meatballs and sauce sit in over low fire for a minute or two. Serve immediately over rice or pasta. Craving for some Mexican meal? Why not try this fast and easy-to-make tacos at home? With the simple ingredients, you can surely beat the clock with this tasty meal. To prepare it, start with chopping the lettuce, tomatoes and onions into bite-sized pieces. In a heated pan, saute sliced onions and add in 250 grams of extra lean ground beef. Cook the beef for 15 to 20 mins over medium fire. Add in two tablespoons of taco seasoning and mix. Prepare the taco shells. Place some lettuce, tomatoes, onions and the cooked beef into the taco shells. Top each taco with grated cheddar cheese and some hot sauce. Serve immediately. One of my to-go recipes when the clock is not on my side, this easy recipe will only take less than 20 minutes to ready. To start with, saute chopped garlic and onions in a heated oil. Add in 250 grams of extra lean ground pork. Cook for 10 minutes. Add in ¼ cup of soy sauce and ¼ cup of water. Let it boil then add in the sliced green beans. Simmer for 5 minutes and add in a teaspoon of oyster sauce. Stir and let it sit over low fire for a minute or two. Serve immediately over rice.